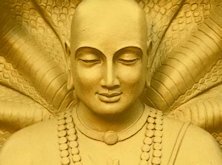 Vedantic thought is based on the vedas – the Upanishads, the Bhagavad Gita, and Brahma Sutras. These are the holy books of the Hindu or Yogi belief system. 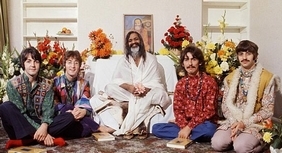 This philosophy has been developed for centuries, from Adi Shankara (800s), to Vivekananda (who came to Chicago in 1893), to Ramana Maharishi, to the Maharishi Mahesh Yogi (who the Beatles sing about). Two core concepts are the Self and Consciousness. The self that we think of in Western thought is made of a gross body and a subtle body, the gross body being the flesh and bone we tie our identities to, and the subtle body being the psyche we think of (think of the two parts of the classic mind-body duality in psychology’s history). Vedantic thought sees humans as having cognitive experiences, emotional experiences, and volition and action in the world. This is very consistent with how psychology sees people too. This refers to how we construct an understanding of the world. One thing we rely on is instinct, the “eat or be eaten” way of thinking hard-wired into our brains. This part focuses on the present life, and happiness or fear/anxiety is based on what we see in front of us. Therapy often involves work specifically with this part of human experience, especially in work with trauma victims. Victims of abuse and traumatic events (from children to soldiers) suffer because they struggle with a constant threat-assessment system, if you will, that interrupts daily life and functioning. Another part of the cognitive experience is the rational mind. Our mind tries to make logical sense of the world (at least the world we get to see) around us. This is a good idea in many ways, but seriously flawed in other ways because the world is not entirely logical and rational. As a result, our understanding is full of errors. Nonetheless, we create a story with a working model to explain the past. We rely on imagination and perception to understand the world. Then we make some discernment (viveka) and form a model of the world, people, and how things work… that guides us. Using that working model of the world to predict the future can lead us to be fearful of negative things to come, anxious we will lose positive things we have, and focused on avoiding both of these. Therapy involves working with this model, either in the form of cognitions (as cognitive therapy does), the stories we create to explain the world (as narrative therapy does), or the internal representations we have of people (as psychodynamic therapy does). A third part of the cognitive experience is the discriminating mind. Along the way in life, we check the accuracy of our model of the world from moment to moment. 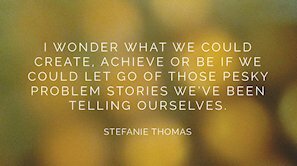 We get wrapped up in what we think we must be and do in order to get the future outcome we want. We let these moment-to-moment assessments… called vritti, or little thoughts in the moment… direct what we do. The mind is thus full of desire and avoidance, doubt and confidence, faith and lack of faith, steadfastness and lack of steadfastness. Think about how we talk about one part of us wants one thing, but another wants something different or even directly opposed… think about how we talk about conscious and unconscious things we know and desire… and how we discuss a “true” self and a “false”, which can lead to forgetting the true self and overidentifying with the false self…. Therapy often deals with these splits in our sense of who we are and how they limit our models of our life (as with narrative and with solution-focused therapy) or our experience of ourselves in the world (as with humanistic therapy). This is consistent with the Buddhist analogy of the mind as like riding a horse. Focus means intending to ride the horse and stay on the trail. Attention or vigilance means noticing that you have started to wander. We tend to think of our mind as the horse in this case and “me” as the rider of the horse. Thus, attention is realizing we have wandered off the trail or starting thinking about other things. We like to say our mind wanders, but… our mind is not separate from us; really, we are the one doing the wandering. After we wander off, we will ourselves to return to the trail. This is not trying to suppress or push away distracting thoughts (that would be putting energy and effort into them). Rather, we calmly and simply let go of the distractions. I liken this to one repetition on the “meditation machine” in your mental gym. We accept that we are focused, lose attention, return to the trail, and do this over and over and over again… this is simply our nature. Third wave cognitive-behavioral therapists would say a therapist can’t teach a person to never think defeating or dysfunctional thoughts. However, they can teach people to catch themselves having negative thoughts, and to take a step back as if they were objective observers. This might mean critically examining thoughts, for example, by looking for disconfirming evidence. It might mean reflecting on how this way of thinking ultimately prevents them from reaching their goals, and causes misery. This is also similar to how The Gottmans see arguments in romantic relationships. Therapists cannot teach a couple to never argue. However, they can teach a couple that in-between arguments, they can visualize how they would like to live together and practice living that way. They can teach couples to catch themselves making mistakes in arguments, take a step back, and repair the damage done. When we focus on ourselves (“I-ness”), we start to confuse the moment-to-moment feedback from our model of the world as defining us. 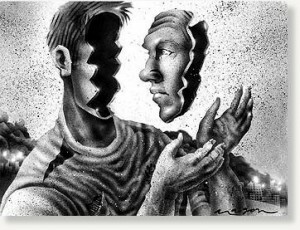 We see ourselves as being what others think we are – attractive, smart, incompetent, dishonest, desirable… We develop emotional attachments and aversions, and seek out people and things that give us the things we like, and avoid people and things that give us the things we don’t like. If you think about it… these two tendencies interact. As we focus on ourselves, we focus on being the thing others seek out and not being the thing others avoid. We try to be attractive and popular, to say and do the “right” things, so that others form attachments to us instead of rejecting and avoiding us. Who we think we are becomes determined by others, from moment to moment. We don’t know ourselves anymore, and forget who we are. If you think about it… this goes further. After thinking this way, we advise others to think this same way… act, dress, talk, think in these ways and not in those ways… because they too should seek to be desired and to avoid being rejected. Annie Lennox has a song that captures this trap perfectly – Keep Young and Beautiful. Either be desirable, or be alone. You can see the enticing power of the messages of other people, leaders, families, and society; be this and do not be that. Unless we know the message is being sent and is wrong, we may not notice that we heard and reacted to it. Not surprisingly…. this leads to a miserable state (klesha). This is very consistent with the Buddhist idea of attachment. Misery comes from worrying about losing what we think makes us happy, feeling depressed or angry when we get what we don’t like, and trying to live life to maximize what we think makes us happy, while avoiding what we think makes us unhappy. The problem is that after a while, we can only think of happiness as something that is outside ourselves. Therapy involves working with people who feel they don’t know themselves – why they do, feel, think… the things they do, and so feel miserable. In therapy, we try to help people see the forces that pressure us to be what others want, and how we hide from others to avoid being what they don’t want. As a result, therapists teach couples and families to find ways to be genuine allow each other to be genuine, and to accept each other with each person’s unique strengths and weaknesses. At some point, most therapists will discuss that the client is not simply what others believe them to be. They are the Self, and feel anger, pain, and fear, but also strength, forgiveness, fortitude, courage, and will. Partners and friends are insensitive sometimes, unlovable sometimes, selfish sometimes… but also sensitive, loving, and caring at other times. Of course… in cases where the partner is violent, abusive, etc… we focus on the client’s safety first; however, over time, seeing a cruel or abusive person as seriously flawed is core to seeing the self as someone who never deserved the abuse or cruelty. Forgiving the other and the self can be intimately tied together, even if repair of the relationship is not possible. Contentment comes from discernment or seeing both our likes and dislikes as simply part of the way of the world. Neither one is better than the other, so neither one is really worth putting too much energy into. This refers to our free choice in all we do in this world, which shapes us, and is part of what we take with us into the next life (this is what karma is about). Therapy can address similar kinds of imbalance in our lives. Consider a person who comes to therapy debating whether they will stay in a relationship with their partner. Sometimes they try to make changes in the relationship and are upset these changes don’t work. Sometimes they think it just easier to “go with the flow” even if they are not happy. Sometimes they try to talk about the problems in the relationship, and sometimes they simply withdraw and spend more time alone or with friends. The balance comes when they begin to accept their partner as a flawed person in many ways, which opens the door to realizing they are flawed too. This can lead to realizing how a partner does (or does not) accept them for the flawed person they are, and how they might be more accepting (or not) of the flawed person the partner is. Sometimes people talk about this as learning forgiveness for others and for oneself. The soul we think of, or the Self with a capital S, is the ahtman… which is really Brahman, the Divine or supreme soul. The Self that is our nature is the same thing as the Divine, not a separate part or a thing that is like the Divine but still different. Our problem is that we have forgotten what our Self is, and have over-identified with the self (with a little s, the self we come to think of in our bodies moving through daily life). Western Christianity (and for the most part associated religions) thinks of one God (it is monotheistic), which may be confusing to some because it sees the one God as having three “avatars” (a God Father, a God Son, and a God Spirit… two male avatars and a sexless one) as well as many lesser divine beings (Mother Mary, prophets, martyrs, saints, angels…) that are separate from the God. Any other “gods” or “godlike” things are not the God (“Thou shalt have no other gods before Me”) which can lead to some significant religious intolerance. The Hindu/Yogi way thinks of one Divine (sort of an uber-monotheism), and the “gods” and lesser divines in stories are just different aspects/avatars of the Divine. You can worship any or all or none of them if you wish. If you worship one god or another, it doesn’t matter because you worship a facet of the same Divine; the faith you choose is the one that makes sense to you and that shapes the particular path you choose to realize your nature. If you don’t worship, but instead just try to live an ethical and peaceful life, nothing changes; you’ve still chosen a worldview that makes sense to you and shapes the path you’ll take to realize your nature. I would argue this kind of belief system is the definition of religious tolerance. Western Christianity thinks of humans as made of something that is like what the God is made of, but clearly not the God. The Catholic Church, for example, teaches that animals have a soul, but it is not like the soul of humans. The soul of humans is like, though not the same as, the essence of God. The hierarchy though puts humans at the top of the developmental pyramid or food chain on Earth. The Hindu/Yogi way thinks that what we and all other things around us are made of is the Divine. Some would say this implies we’re no better than the other rocks, bugs, dinosaurs, trees, volcanoes, mammals… that also exist here. That’s in one way saying all of it is equally important, but in another way saying all of it is equally unimportant as just one part of a very large world. Western Christianity holds that the point of existence here is to form a connection to the God, and after this (one) chance you then either spend eternity connected to or disconnected from the God. The Hindu/Yogi way holds that the point of existence here (and in whatever the next life holds) is to remember our true nature, and keep living until we accomplish that (reincarnation). Western Christianity holds that this time on Earth is your one chance to connect to the God. Thus, the net result of what you individually achieve here (you are to be judged and held accountable for the good deeds vs unforgiven sins you’ve done) is critical because it has some long-lasting (eternal) implications, and there is no “get it right the next time” (a stray Billy Joel reference). The Hindu/Yogi way holds that this is just one of many lives. Most of us will make mistakes we have to set right, now or in the next life, and we will try to “get it right the next time” as many times as it takes. This life is impermanent, as is the world itself, which has been destroyed and remade many times. Thus, what you individually achieve is not so important. What matters is how you live (whether you remember your true nature when you act) in connection to the world (the rocks and volcanoes, the bugs and trees and mammals, and the people) around you. Thus, when you think about it, this highlights a profound difference in worldview and understanding of the human condition. In closing, as with Buddhism, I would offer that learning about the basic ideas, goals, and perspectives of Vedantic and Yogi offers us a way to understand and help people from other cultures who might be very different from us. However, more than that, it gives us a better way to simply understand the human condition, and with that understanding help people. Kang, C. (2010). Hinduism and mental health: Engaging British Hindus. Mental Health, Religion & Culture, 13(6), 587–593. Paranjpe, A. C., & Rao, K. R. (2008). Psychology in the Advaita Vedanta. In K Ramakrishna Rao, Anand Paranjpe, and Ajit K Dalal (Eds.) Handbook of Indian Psychology (pp. 253 – 285). India: Cambridge University Press.